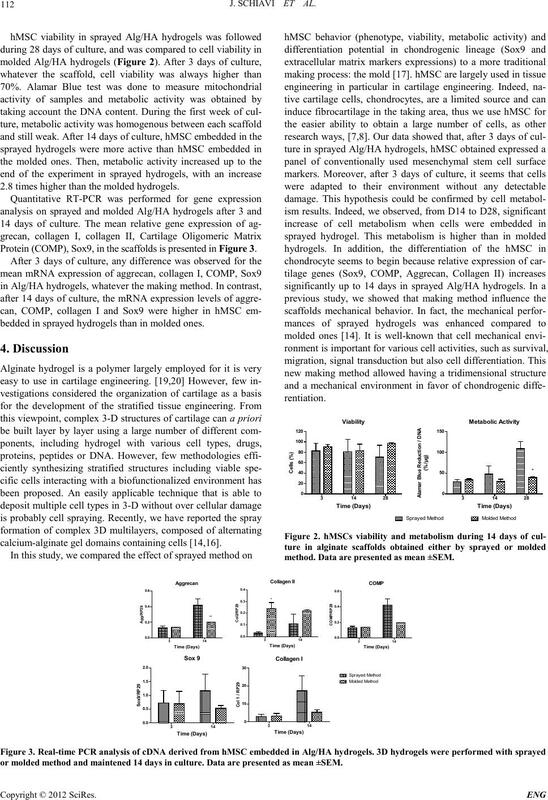 Does Making Method of Alginate Hydrogel Influence the Chondrogenic Differentiation of Human Mesenchymal Stem Cells? To overco me cartila ge inju ry, strat egies have b een d eveloped in the last fe w years b ased on tissu e engineerin g to rebu ild the defects. tissue which present a limited self-repair cap acit y like carti lag e.
mechanical loads to cells and their biodegradability, [4, 5]. their interest for cartilage engineering. surgery. Bone marrow was aspirated and diluted in HBSS. J. SC H IAVI ET AL. NaCl solution supplemented with 10 mM Tris at pH 7.4. (thickness = 1.5 mm, diameter = 25 mm; Bern, Switzerland). with the CaCl2 solution (102 mM), during 15 min. thasone and 1 mM of CaCl2), changed twice in a week. (FACSCalibur; BD biosciences , France) were used. sprayed Alg/HA hydrogel compared to the monolayer culture. were also negative for HLA-DR.
day 3). Data are presented as mean ±SEM. 2.8 times higher than the molded hydrogels. Protein (CO MP), Sox9, i n the s c af folds is pr es e nte d in Figu re 3.
bedded in sprayed hydrogels than in molded ones. calcium-alginate gel d omains contain ing cells [14,16]. method. Data are presented as mean ±SEM. or molded method and maintened 14 days in culture. Data are presented as mean ±SEM. This work was supported by the "Lorraine region" grant. N.
pedic surgery (Contrat d’interface INSERM-CHU). Drug Deliv Rev, vol. 60, pp. 243-62, 2008. R. Langer and J. P. Vacanti, "Tissue engineering," Science, vol. 260, pp. 920-6, 199 3. Rese ar ch Part A, vol. 92A, pp. 1139-1144, 2009. E. Fragonas, M. Valente, M. Pozzi-Mucelli, R. Toffanin, R.
nate," Biomaterials, vol. 21, pp. 795-801, 2000. B. L. Schumacher, S. Gortz, K. Masuda, W. D. Bugbee, and R. L.
defects," Clin Orthop Relat Res, vol. 466, pp . 1912-20, 2008. N. S. Hwang, S. Varghese, H. J. Lee, P. Theprungsirikul, A.
car tila ge ti ssu e eng in eerin g," J Biomed Mater Res A, vol. 93 , p p.
 C. S. Lee, J. P. Gleghorn, N. Won Choi, M. Cabodi, A. D.
 K. W. Ng, C. C. B. Wang, R. L. Mauck, T.-A. N. Kelly, N. O.
dic Research, vol. 23, pp. 134-141, 2005. B. A. Harley, A. K. Lynn, Z. Wissner-Gross, W. Bonfield, I. V.
terfaces," J Biomed Mater Res A, vol. 92, pp. 1078-93, Mar 1. T. J. Klein, S. C. Rizzi, J. C. Reichert, N. Georgi, J. Malda, W.
for zonal ca rti lage repa ir u sing h ydrogels," Macromol Biosci, vol. 9, pp. 1049-58, Nov 10 2009. T. J. Klein, B. L. Schumacher, T. A. Schmidt, K. W. Li, M. S.
Matter, vol. 6, pp. 5165-5174, 2010. H. Mjahed, C. Porcel, B. Senger, A. Chassepot, P. Netter, P.
engineering," Soft matter, vol. 4, pp. 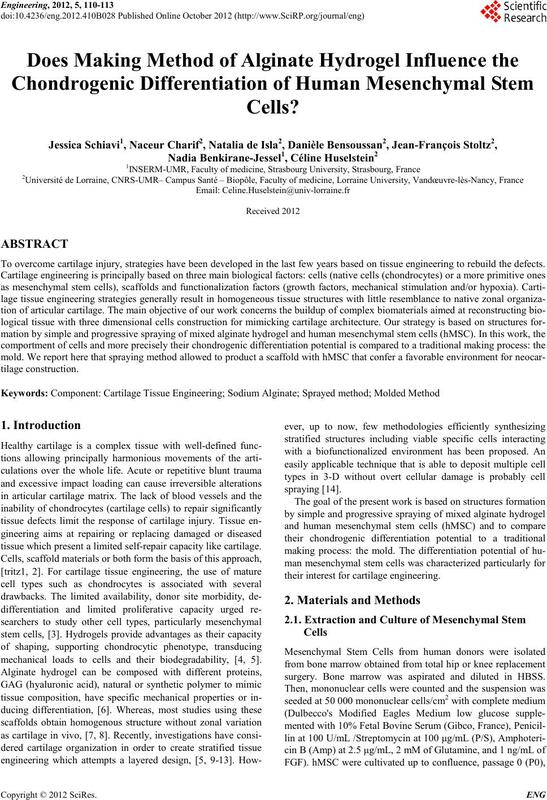 1422-1429, 2008.
oussan, J. Magdalou, N. Benkirane-Jessel, J. F. Stoltz, and C.
with mesenchymal stem cells," Biomed Mater Eng, vol. 20, pp. guluronic acid content and matrix synthesis," J Orthop Res, vol. S. C. N. Chang, J. 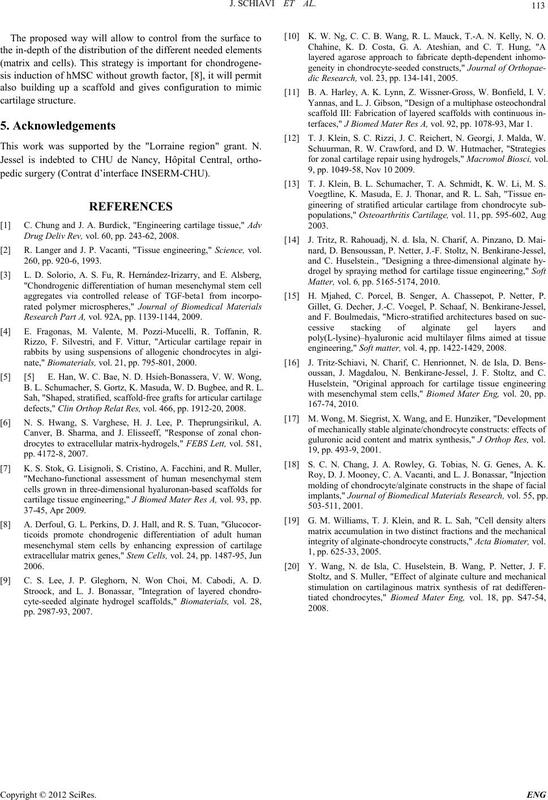 A. Rowley, G. Tobias, N. G. Genes, A. K.
implants," Journal of Biomedical Materials Research, vol. 55, pp . 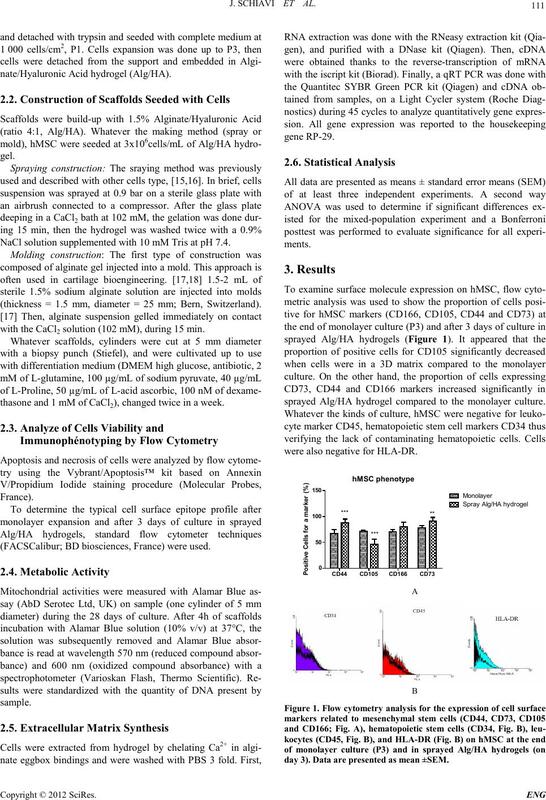 integrity of alginate-chondrocyte constructs," Acta Biomater, vol. 1, pp. 6 25-33, 2005. Y. Wang, N. de Isla, C. Huselstein, B. Wang, P. Netter, J. F.